This post is written by fellow blogger, Tianhao, from TH Nomad. Seems like he had an extremely wonderful time during his stay at The Majestic Kuala Lumpur! Think of Kuala Lumpur and the image that springs to mind are of the soaring twin towers amidst other modern skyscrapers. With rapid industrialization, traces of her British colonial history are gradually fading into oblivion. However, the Majestic Hotel Kuala Lumpur is attempting to change all that. This newly opened 5-star hotel is a beautiful restoration of the old Hotel Majestic, which was a gathering place for the colonial elite, unrivaled in its prestige and luxury back in the colonial days. Today, a stay in the Majestic wing allows one to experience a touch of the colonial heydays, including having a personal butler attached to the room! Recently, I was fortunate to be invited to stay in this iconic hotel. As a destination that’s well known for its diversity, the essence of a trip to Southeast Asia for most would probably include a rundown of the well-known ancient ruins, beaches and secluded islands, through natural landscapes and tropical rainforests and generally having a good time in the region’s megacities. A not so prominent (and less popular) theme are its old towns, some of which have been preserved as UNESCO World Heritage Sites. These are deserving destinations in their own right, and are perfect supplements to those doing long trips across the region. Earlier this year, I had inadvertently completed a small milestone by visiting all the UNESCO World Heritage towns in Southeast Asia. As there are only five, it’s no mean feat. I was not really ticking it off any list. It just happened. Okay guys. I’m sharing this with you because I think you can save quite a bit with this! For someone like me who lives just across the causeway, trips to Malaysia are almost considered inevitable. In my 5 years in Singapore, I must have visited Malaysia ten or more times. In terms of duration, it can be as short as a daytrip to as long as a few days. While the transportation options to Malaysia can be as cheap as chips, sometimes I come home and find that I’ve incurred hundreds of dollars in roaming charges alone. It’s quite an annoyance considering that I don’t receive any physical good in exchange for what I pay for (yes, I am a visual person) so it’s really important for me that my mobile services are as cheap as possible! After a jampacked Day 1 of “A Date With Bloggers in Malacca 2012”, our Day 2 was shaping up to be another smorgasbord of exotic dishes, cultural sights and audiences with VIPs. We had an early Sunday morning – our early morning wake-up call was due to a scheduled visit to the Cheng Ho Museum for breakfast and a short tour. Breakfast was simple, and consisted of some fruits and bee hoon (rice vermicelli). 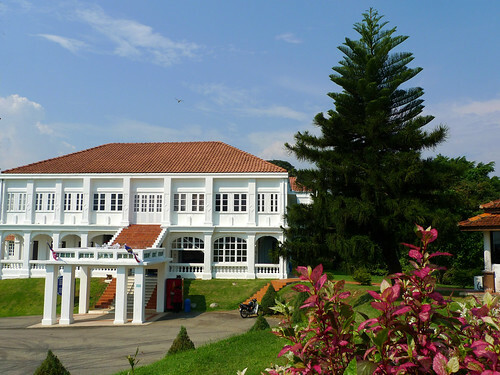 It was followed by a short tour of the museum which was a showcase of the life and times of Cheng Ho, the famed Chinese explorer who preceded the well-known Spanish and Portuguese explorers of yore. The museum consisted of four floors but I only managed to see two. Various methods are used for presentation here, including dioramas, multimedia and even interactive means. It’s a place befitting history buffs, and certainly wouldn’t disappoint those interested to know more about Southeast Asian history. I was recently invited over for a food-filled weekend in Malacca, courtesy of a bloggers event hosted by people from the Asia Food Guide. It was not too long ago when I last visited this UNESCO World Heritage city on a daytrip. Nevertheless, I was really looking forward to this “revisit” as Malacca is well-known as a food-lover’s paradise – especially when it comes to Nyonya cuisine – and I didn’t really get to try much during my last visit. I was staying overnight this time so I reckoned I would have more time to see and appreciate more of the nooks and crannies of this historic town. This is probably mentioned before – the general friendliness of people in Southeast Asia never fails to be an added plus to me during my trips. My host this time around were true exemplars of the warm Malaysian hospitality, making sure that we were alright and trying their best to make the event enjoyable for all (which they succeeded in doing!). 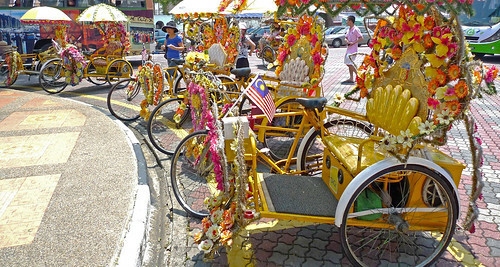 It was great to again have the chance to venture someplace much friendlier, and Malacca proves that it needn’t be far. It took me over a year to post Part 2 of my Southeast Asian roundup, my little ode to this dynamic and diverse region which I call home. One year on and I still find myself traveling around Southeast Asia though now it’s mostly for work, transit or for back and forth trips between Manila and Singapore. More trips are certainly warranted in the future. As my “tribute” to this region, I am choosing my top 11 sights from the 11 countries that make up Southeast Asia. To avoid being concentrated over a particular nation, I am picking one sight out of each of the 11 countries – my personal favorite from each. If there was one sight / monument / building / attraction that people tend associate with Malaysia, it would undoubtedly be the iconic Petronas Towers in Kuala Lumpur. Though no longer the tallest buildings in the world, the twins still never fail to make an impression to those who visit the city, no matter how many times it’s been. It was my fourth visit to Kuala Lumpur when I took the photo above and I was still awed by the Middle Eastern motif, particularly the cross section of the towers which was based from the Islamic Rub el Hizb symbol. It’s especially picturesque at night when it’s lit up very brightly like crystal with spotlights and can be seen from several miles away. One of my friends was about to end her 3 month stint here in Singapore so we decided to go on a daytrip to Malacca just a few weeks before she left for good. We met up at the Kovan Bus Terminal and paid S$19 (around US$14) for a one-way bus ride to the UNESCO World Heritage town in Malaysia. The ride took up almost 4 hours and was mostly uneventful. 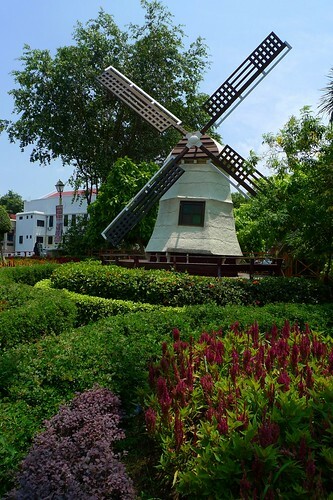 Malacca is a compact city with many of the main sights just within walking distance. After arriving at our destination, we took a public bus (MYR 1) to the historical area near the Christ Church. We went on a Sunday so the place was brimming with tourists, mostly weekenders from Singapore. We went to have lunch at the famous Jonkers Street. The food is almost similar to Singapore’s except they have this local specialty called “rice balls.” It’s meat-flavored rice shaped into a … you guessed it! I didn’t like it to be honest, but I was famished so I barely noticed the weird chewiness of the thing. Afterwards, we went to the Baba Nyonya Museum which is an old Peranakan house turned into a museum. It was ok – I’ve been exposed to this culture in Singapore so it wasn’t anything new. We then proceeded to Porta de Santiago which is now just an isolated fort situated in a very commercialized part of the city. We didn’t stay for the night but those who stay overnight may enjoy the light and sounds shows in the area during the evenings. We made the climb up a hill to reach the ruins of St. Paul’s Church. It’s just an empty shell now, but the view from the top is wonderful. There is also a bunch of large stone tablets neatly arranged by the church walls. That was our last stop for the day, and we decided to rest for a while and have a little snack. We went to this dessert place in the mall right across Porta de Santiago. I had the golden pomelo dessert (US$2.50). It was a great way to end our trip as we were all soaking wet. 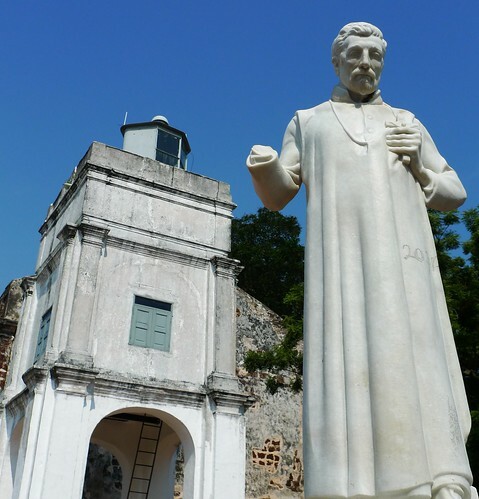 Malacca may not be a mindblowing place, but it does live up to its reputation as a good daytrip destination. Malacca is also a foodie’s haven but I did not manage to try much owing to my short time there. 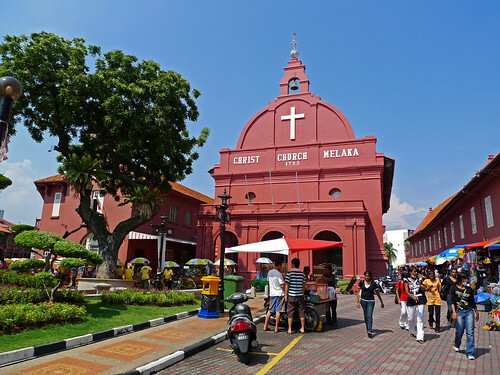 For more restaurant recommendations in the city, you can check out this Malacca food guide. Tip : Buy your return tickets in Malacca if you can. You will end up saving more than 50% of the ticket price.